During the fall 2017, crown princess Victoria launches a series of hikes through all Sweden's provinces. The hiking starts in September 2017 and will be carried out in the next few years. The county administrative boards in interaction with the local community will play an important part in designing the visits. Each province is visited during a day where the crown princess walks to experience a part of Sweden's uniquely accessible and varied nature. The crown princess wishes also to increase the value of outdoor life and movement in connection with this project through Sweden. - This was something that Crown Princess Victoria began to think about a year ago, when we planned the arrangements around her 40th birthday. It was a wish she had - to have the opportunity to visit all Sweden's provinces with a focus on outdoor life and active movement. The purpose of the hikes, which will be one day at a province, is to showcase Sweden's nature. - The Crown Princess wants to visualize the treasure that Swedish nature is. All who live and work in our country can experience it and through the province hikes she wants to highlight it, said Thorgren. Victoria's and the court's idea is that the 25 hikes should be carried out for a period of about two to three years. - It is 25 days spread over different months and seasons. It should also go hand in hand with the official duties and other commitments that the Crown Princess has during the year. The first hike takes place next Saturday in Västergötland, which is Crown Princess Victoria's Duchy. Victoria, among other things, visits the Varnhems monastery area and then walks along the pilgrim trail along the mountain Billingen. The walk ends at Hornborgasjön. - The Crown Princess has been looking forward to initiating these hikes for a long time. The hope is that more people see Sweden's amazing nature and thus appreciate and be careful about nature, said Thorgren. On Saturday, September 9th, HRH the Crown Princess visits Västergötland to wander along the pilgrimage route between Varnhem and Hornborgasjön. The hike in her duchy is the first in a series of hikes through Sweden's provinces. The hiking is done mostly on narrow trails along and at Billingen. Kata farm and Naturum Hornborgasjön can be reached by car. The County Administrative Board has played an important part in designing the visit, in cooperation with local authorities and the local community. - We are very pleased that the Crown Princess chooses to start her province hikes in her duchy in Västergötland, says acting County Governor Lisbeth Schultze at County Administrative Board Västra Götaland. We look forward to being able to showcase this part of the county, rich in bird life, nature and culture. 15.00-15.30 Hiking: Heljesgården - Fågeludden. Groups with young people walk along. 15.30-16.00 Closing session at Naturum Hornborgasjön (at the far end of Fågeludden). Nature and bird activities with youth groups. Photo opportunity for the media. Those who dream of walking in beautiful scenery with Crown Princess Victoria can take the chance on Saturday. Then the duchess of Västergötland will walk 13 kilometers in "her" province. And whoever wishes is welcome to hang on. Recently, the court announced that Crown Princess Victoria will conduct hikes in Sweden's 25 provinces. On Saturday it is time for the first hike and it is set in the heart of Västergötland. The walk starts at 11 o'clock at Kata Gård in Varnhem which is not a coincidence. Västergötland gave the Crown Princess a replica of Viking Lady Kata's silver clasp on her 40th birthday. About four hours and 13 kilometers later, the crown princess arrives at Naturrum next to Hornborgasjön. - The trip takes place along the pilgrimage route at Billingen in the direction of Hornborgasjön and Naturum, which is the final destination. Along the way, it is also planned for field lunch on the plateau and visit to Heljesgården, where we will see forest and agriculture from the past, says Mikael Appelqvist from the County Administrative Board of Västra Götaland to SLA. There will be an official follow-up in the form of politicians (from Skövde, Skara and Falköping), representatives from the County Administrative Board of Västra Götaland, Säpo staff and many others. But also the public is welcome to walk with the Crown Princess. - The idea is that this should be done openly and in the normal environment, so there are no lockouts or something like that. We expect there to be some interest, says Appelqvist. Just a fabulous idea and what a great way to just met other people. This will surely bring the crown princess much closer to the people and there will be some great ideas sprung from this I bet. To see all of Sweden in her glory while walking along with the crown princess is something that will always be remembered and treasured. - We have understood that there is a lot of interest in the Crown Princess's visit and wait for many visitors, says Mikael Appelqvist, responsible for the program at the County Administrative Board. - The pilgrim trail is open to all, but we hope it will not be too messy at the front where the Crown Princess walks. It is usually a fairly narrow ladder and a little difficult terrain, so good shoes and suitable clothing are recommended, says Appelqvist. When the company has arrived on Billingen's plateau, lunch will be on the theme of Healthcare and Health. - The exact menu I do not know, but there are no white tablecloths, champagne and caviar, but a standing, field lunch. Together with groups of young hikers, they continue through Heljesgården down towards Hornborgasjön and Fågeludden where there are nature and bird activities with youth groups and photo opportunities for the media and the public. - There will be no official appearance or program in this way, but this is for the Crown Princess and her interest in nature, says Mikael Appelqvist. What does Säpo think of such an extended effort? - This is new to everyone involved, but they have traveled all the way and are well prepared. It's a little unusual effort and, moreover, the first time, but they're prepared, says Appelkvist. How will the weather be during the hike? - Unfortunately, there are no uplifting forecasts right away. We are prepared for rain, but it will certainly be a nice day for all involved, Mikael Appelqvist concludes. Maybe Daniel will be hiking today too, when the tour begins at their duchy Västergötland? Photographer Pelle T Nilsson met Victoria and Daniel at the train station this morning. Victoria's aide-de-camp walked behind them. EDIT: Yes, Daniel will be hiking with Victoria. The first of Crown Princess Victoria's 25 hikes is made on Saturday in Västergötland. On Saturday morning, the crown princess went to SJ's train to west - but she was not alone. On the platform at the Central in Stockholm it appeared that husband Prince Daniel came with her, something that was not planned from the beginning. - That's right. We have no information about when it was decided, but the prince was able to accompany, and so he does, said Johan Tegel, press secretary of the court. If Prince Daniel had to change his schedule, he did not want to go into it. But in the royal family's calendar it is clear that the Prince from the beginning should not accompany. - He is accompanying the Crown Princess today at the visit to Västergötland, says Tegel. What a wonderful idea for the crown princess to do, I so wish I could be there just to see her and Daniel. Those that go with her on this walk will have tons of memories to treasure and cherish always. What a way to really mingle with the people. Crown Princess Victoria and Prince Daniel are seen at the start of their walk through a pilgrimage track in Västergötland, Sweden on Saturday. Crown Princess Victoria and Prince Daniel are seen at the mountain of Billingen. Crown Princess Victoria is seen plowing behind two horses at Heljes farm. Crown Princess Victoria and Prince Daniel tries out their gift, a bench decorated with two cranes, at Naturum Lake Hornborga. Crown Princess Victoria releases a recently ringed Eurasian blackcap at Naturum Lake Hornborga. "It feels great, this will be fun", said Daniel when their started their hike. "Rain and uphill road don't stop Victoria"
From the Instagram of photographer Pelle T Nilsson: "Now sitting in the car. Half dead. The first 4 km was up to the mountain." He had walked 15,8 km and taken 22579 steps. There were many in place at Kata Gård (Farm) despite the rain pouring down this morning. The Crown Princess's landscape walks mean that she will hike in all the provinces of Sweden in the coming years. She does this to illuminate outdoor life and promote to experience the Swedish nature. Lang / Nordgren family from Vinninga with their sons were there. - It's valuable that they come here and it's fun that they visit the whole Sweden and show that they are engaged, says Magnus Nordgren. Someone who were pleased that it became just the pilgrim route as the first province visit are Pilgrim Association's chairman Barbro Westergren and Vice Chairman Magnus Gunnarsson. - It's amazingly nice because we've been working on this trail for just over ten years. What can the Crown Princess expect from the walk along the pilgrimage? - Tranquility up in Billingen and to sit down at the vantage point and just enjoy and enjoy nature and look out over Hornborgasjön. Yes, it was raining, but Victoria and Daniel seemed to have a great time anyway. Spent this saturday afternoon in really nice company! My princess is so lucky to have had a chat and hang out with our beautiful crown princess ... What a amazingly fine initiative to invite the children to attend when she visits our beautiful region! A video and some good photos of the visit. At the video Victoria and Daniel are having some lunch and inaugurating their gift by sitting on it. The photos of Victoria plowing behind two horses are great. That the hike took place just between Kata Gård and Hornborgasjön was after a proposal from the County Administrative Board in Västra Götaland County. - We made a proposal for suitable hiking in Västra Götaland and have come along with the court that this may be a good walk for the Crown Princess. We think this is a great area to show off, said Sven Swedberg, Head of the Nature Department at the County Administrative Board. The walk between Kata farm and Hornborgasjön is about 13 km and goes through the woods at Billingen with views of Hornborgasjön and the surrounding countryside. Among other things, representatives of Skövde, Skara and Falköping and the County Administrative Board were hiking with Victoria and Daniel. When the group came to Hornborgasjön on Saturday afternoon, Victoria and Daniel visited different stations for children organized by Naturum, which included bird marking. The crown princess also got a bench as a gift. When the day ended, both Victoria and Daniel were pleased. - It was a very fine hike. An amazingly lovely experience, Crown Princess Victoria said. - Terrific, supreme, added Prince Daniel. Short video from court Instagram, where Victoria speaks about her hopes on these hikes. "My greatest wish is that people take the most of the environment they see around them and see all the possibilities of it as they are. For discoveries and movement, and just to enjoy about the nature"
Victoria said: "It was a great day and we would really like to express our warmest thanks to all those who had a part in the program, the setup and implementation. But also because we got to experience this together and got to enjoy your beautiful nature". Photos from Twitter of Skara Municipality's manager Gustaf Olsson, a group photos and Victoria and Daniel at Kata Gård. At Kata Gård, the museum manager Luitgard Löw welcomed Victoria and Daniel. Inside Kata Gård, Maria Vretemark showed and told about what largely writes about the Swedish story. The round trip ended with the delivery of gifts to Victoria and Daniel from Västergötland Museum and Skara Municipality. To honor the day, the Crown Princess was adorned with the Kata jewelry she received as a gift from the Västra Götaland region on her 40th birthday. Suitable for just this visit! Outside a large crowd crowd and a big press were waiting. 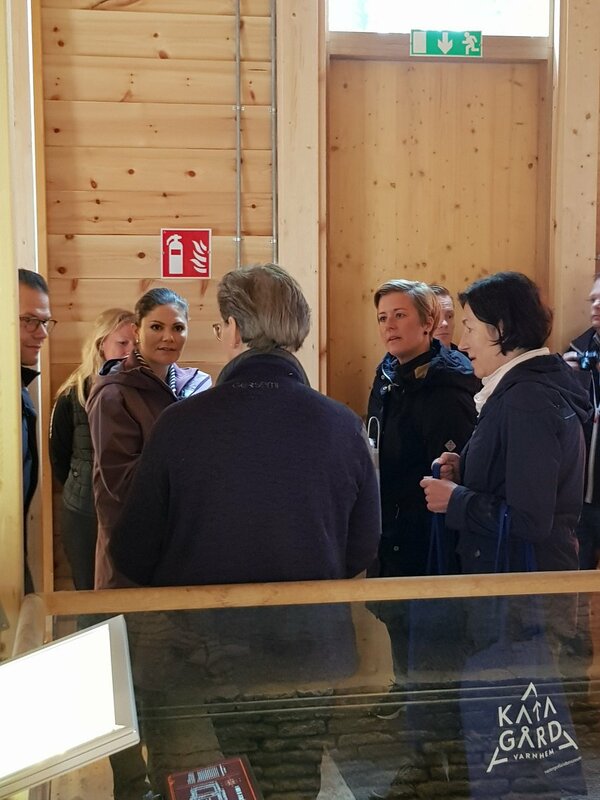 But it was the expectant Mullegrupp, which the Crown Princess specifically had asked from the Swedish Outdoor Association to meet, which took the Crown Princess's attention. Victoria talked for a while with the little ones, then started to hike at the pilgrimage route. - To start here at Kata Gård and the remains of Sweden's perhaps oldest stone church, is of course special, said the Crown Princess to NLT before continuing along the trail, from Varnhem to Naturum Hornborgasjön. 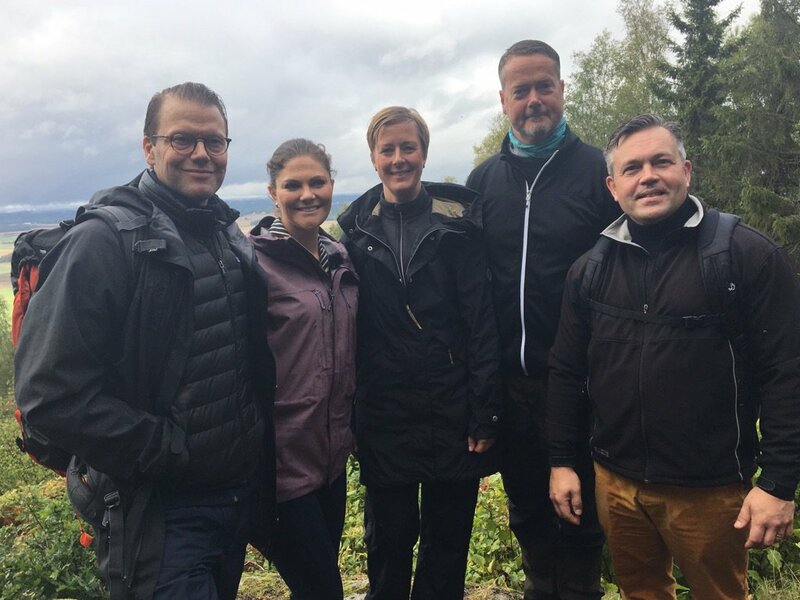 Today, the Crown Princess Victoria visited Hornborgasjön, as part of a walk along the Pilgrim Trail from Varnhem to Fågeludden. There, Christopher Magnusson and Lotta Berg from the Hornborgasjön field station were given the opportunity to show how bird ringing is done, and a young blackcap got round the leg in front of not only the Crown Princess but also some children's groups and a press group. The Crown Princess then received the honor of releasing the bird when it was ringed, measured and weighed, after which it continued on its move towards the Mediterranean-Africa. thank you LadyFinn for the great coverage. When CP&Sofia unveiled a stone bench wedding present. It was great to see how both Victoria and Daniel were talking to both the big and the small who took part in the walk. In Varnhem Victoria got a nice flower bouquet from a small child, and carried the bouquet the whole hike, for me an important signal, the bouquet was appreciated. During the walk there was a small stop with coffee, food and little happenings for the Crown Princess. Among other things, she had to plow the horse and ring birds. Victoria and Daniel also opened "Transätet", a chair for two overlooking Hornborgasjön, specially crafted by a local craftsman. Finally, the municipality of Falköping submitted a walking stick as a memorial gift to the Crown Princess. It has been exciting to be "behind the scenes" before this hike. It has involved many people and it has been meticulously planned. Polices from SÄPO and "common" police officers have been involved throughout the day. Funny that there were "local" police from Falköping during the day, it felt good that the Crown Princess, Prince Daniel and I were in safe hands. When we arrived at Heljesgården there were many people living in Broddetorp who came up and it was incredibly fun to meet many who I knew and which I have missed over the years. After 20,000 steps in beautiful nature and with nice company I am satisfied and a little tired. Photo from Facebook of Swedish Outdoor Association/Skövde, their Skogsmulle group meeting Victoria. The court publishes these great HQ photos from Victoria's and Daniel's hike in Västergotland at their website at the pressroom. The photos have been taken by photographer Raphael Stecksén. The photos are from here, there are also low quality versions. This woman is truly amazing, not only is she beautiful on the outside, the inside of her soul and heart is beautiful for she is so very dedicated to her country and the people. What a queen she will make in the future and a mother for the next queen, her daughter. Having found the soul mate of her heart has her this remarkable woman of today. Those pictures are fabulous of her, they show her true beauty more so then formal pictures do. Victoria's second hike in swedish provinces will be on Friday 6th October in Västerbotten. During the day, Victoria attends the inauguration of Arenaparken. All school students in Norsjö Municipality and the public are invited to attend a celebration focusing on health. The aim with Arenaparken is to get more citizens and visitors to want to move while giving the chance to experience the beautiful scenery. During the Crown Princess's visit, she will attend the opening ceremony and get the opportunity to go a little hike through the sport's variation in a scenic area. - It is amazingly fun that she will come and wants to attend the opening ceremony. It will be fun to show her this initiative, which we hope will help more people move more, both schoolchildren and the public outside school time. The Crown Princess visited the municipality of Norsjö in 1997 and opened the Victoriascenen. I hope as many as possible come and welcome her back to Norsjö. says Mikael Lindfors, municipal commissioner. HRH The Crown Princess recent hike in Västergötland.